The "Day of the Dead" stay-over package puts a map of history-filled outposts in your hands. 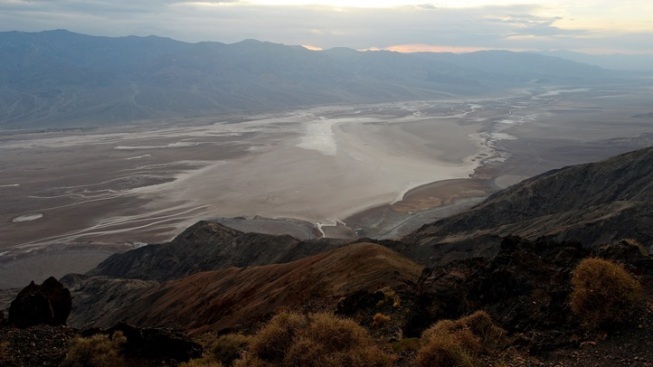 LIKE THE MOON, BUT WITH TOWNS: Death Valley National Park is often presented as a lunar landscape here on earth, and with fine reason: It kind of is. Granted, there's an atmosphere in Death Valley that doesn't require us to don giant, glass-front astronaut helmets, and the gravity in the national park is pretty much the same as the gravity on the outside of the national park (meaning no big, bouncy astronaut leaps are possible, not without a trampoline). But the valley's stark vistas and empty stretches can feel moon-like, especially by the light of the moon. That makes it a little ghostly come the autumn, when the sun starts to set at an earlier hour and the toasty air takes on a chill and the idea of being on another planet, via a national park, begins to intrigue. Furnace Creek Resort wants to help further that phantom-y feeling that fall brings to the desert, along with the reminder that Death Valley really isn't so devoid of signs of civilization, after all. Ghost towns remain, in various states of crumble and decay and photo-ready awesomeness, both around the park and near its borders, and autumn's cooler ways, and supernatural airs, make it the ideal time to go exploring. DAY OF THE DEAD PACKAGE: If you're trotting out to Furnace Creek over the most haunting weekend of the year -- think Oct. 30 through Nov. 2 -- you can book this stay-over special. You'll get either a cabin to retreat to or a room and a map to the ghost towns of the area (hello, Panamint City, hello Rhyolite, hello Leadfield, how're you doin', Skidoo). To keep in the Dia de los Muertos theme, a pretty tile, complete with the traditional calavas on the front, is also part of your package goodies. Think of this getaway as a quieter, more history-filled way to mark both Halloween and the Day of the Dead, without the mondo parades and costumed affairs. Finding yourself in a place that famously has a rather macabre moniker -- we're not referring to the "Valley" part of "Death Valley" -- over the most famously atmospheric of holidays, with lots of ghost towns within driving distance, has its offbeat pleasures. To wend your way back to Furnace Creek Resort, either the Inn or Ranch, for a night of rest, ups the pleasure part (just make sure you leave the ghosties behind in the towns you visit, lest your hotel room get a little crowded).